You might remember shopping at Sister Jane in 2011, back when the London label was founded. All feminine whimsy and vintage-inspired eccentricity – think Peter Pan collars, ditsy prints and floaty fabrics – the brand’s sweet aesthetic has always had a dedicated following. But something about the more recent collections signals a renaissance for the Notting Hill-based brand. Perhaps the label feels more relevant than ever because of our current preoccupation with all things hyper-feminine. From Shrimps' childlike hair slides, to Molly Goddard’s frothy tulle, to Cecilie Bahnsen’s almost clerical dresses, we’re hooked on a delicate, soft aesthetic that Sister Jane has tapped into since its inception. "Women are at the centre of the brand; we work for and with them," designer Gregory Apers tells Refinery29. "We find in vintage aesthetics what we also find in femininity: an abundance of stories. It is unique, aspiring and nostalgic as well as being emotional, sensitive, fragile and strong at the same time. Women are our storytellers: we are inspired by both what they wear today and what they wore yesterday." Saying this, the brand currently only goes up to a size 12. When we asked Sister Jane why it had such a limited size range, this was the response: "As a young brand, we're unfortunately limited in the range of sizes that we can stock. We would love to be able to have as many sizes as possible and to offer our sisterhood both larger and smaller sizes than are currently available." "We design with size fluidity in mind which is why we label our clothes as small, medium and large - we use UK sizes very much as guidelines. In the next month we are adding an additional larger size and are constantly reviewing the ability to add more sizes as we continue to grow." 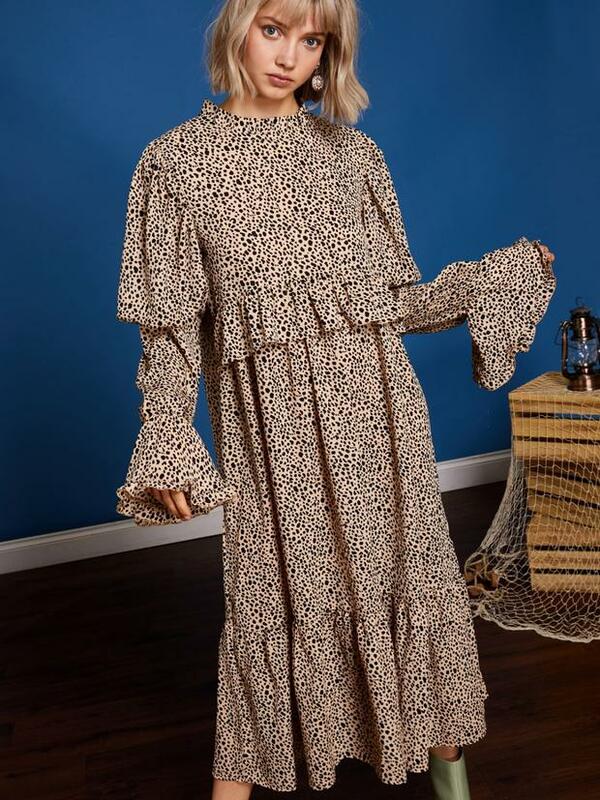 Now with 70.5k Instagram followers and a strong fanbase of influencers donning its pieces at Fashion Month, Sister Jane's business model is the same as it always was: rather than seasonal collections, every six weeks or so around 50 new products are introduced and presented as a story. You might also be familiar with Ghospell, Sister Jane’s 'big sister' brand, which launched a few years ago. Offering a slightly more grown-up and easy-to-wear aesthetic, dusky blue boiler suits meet printed balloon-sleeve blouses, pleated midi skirts and work-appropriate silk dresses. Sister Jane’s latest collection, Porcelain Avenue, which "takes inspiration from suburbia", is full to the brim with puffed-sleeve blouses, pearl hair slides and broderie anglaise sun dresses – all perfect for spring. "Expect taffy pink, honey yellow pastels and a Dalmatian print or two," says Apers. "It’s uber-feminine and features plenty of unexpected design touches that our customers love us for." Whether you go for exaggerated sleeves and tiered ruffles or maxi dresses with '70s collars, there’s something for everyone looking to add a heavy dose of femininity to their wardrobe. This story was updated at 13:25pm on 18th March.